Blended learning appears to facilitate learner empowerment more readily than either face-to-face or fully online courses. This contention is supported by a review of literature on the affordances of blended learning that support Thomas and Velthouse’s (1990) four conditions of empowerment: choice, meaningfulness, competence, and impact. Blended learning offers students choice and flexibility about when and where they can participate in the online portion of their course. The approach also appears to be consistent with their preferred method of learning as satisfaction tends to be higher than in fully online or face-to-face courses. Self-efficacy is typically stronger in blended courses compared to the other two instructional modes. Lastly, students in blended courses tend to perform better than their peers in fully online or face-to-face courses, hence have a greater sense of succeeding. Recommendations on blended course design to enhance learner empowerment are presented. Owston, R. (2018). Empowering Learners through Blended Learning. International Journal on E-Learning, 17 (1), 65-83. Waynesville, NC USA: Association for the Advancement of Computing in Education (AACE). Retrieved April 25, 2019 from https://www.learntechlib.org/primary/p/177966/. Allen, I.E., Seaman, J., & Garrett, R. (2007). Blending in: The extent and promise of blended education in the United States. Sloan Consortium. Retrieved from https://secure.onlinelearningconsortium.org/publications/survey/blended06 Bandura, A. (1994). Self-efficacy. In V.S. Ramachaudran (Ed. ), Encyclopedia of human behavior (pp. 71-81). New York: Academic Press. Bernard, R.M., Borokhovski, E., Schmid, R.F., Tamim, R.M., & Abrami, P.C. (2014). A meta-analysis of blended learning and technology use in higher education: From the general to the applied. Journal of Computing in Higher Education, 26(1), 87-122. Http://dx.doi.org/10.1007/s12528-013-9077-3Bonk, C.J., & Zhang, K. (2008). Empowering online learning: 100+ activities for reading, reflecting, displaying, and doing. San Francisco, CA: Jossey-Bass. Chickering, A.W., & Gamson, Z.F. (1987, March). Seven principles for good practice in undergraduate education. American Association for Higher Education Bulletin, 7, 3-7. Conger, J., & Kanungo, R. (1988). The empowerment process: Integrating theory and practice. Academy of Management Review, 13, 471-482. Forte, J.A., & Root, V. (2011) To ITV or Not to ITV: A comparison of hybrid and web-enhanced approaches to teaching a macro-course in human behavior in the social environment. Journal of Human Behavior in the Social Environment, 21(1), 82-96. ., & Houser, M. (1996). The development of a learner empowerment measure. Communication Education, 45 (3), 181199. Garrison, D.R. (2011). E–learning in the 21st century: A framework for research and practice (2nd ed.). London: Routledge/Falmer. Garrison, D.R., Anderson, T., & Archer, W. (2001). 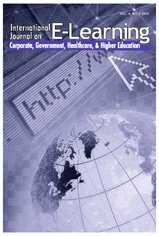 Critical thinking, cognitive presence, and computer conferencing in distance education. American Journal of Distance Education, 15(1), 7-23. Garrison, D.R., & Kanuka, H. (2004). Blended learning: Uncovering its transformative potential in higher education. Internet& Higher Education, 7(2), 95-105. Http://dx.doi.org/10.1016/J.iheduc.2004.02.001Garrison,D.R., & Vaughan, N.D. (2008). Blended learning in higher education: Framework, principles, and guidelines. San Francisco, CA: Jossey-Bass. Houser, M.L., & Frymier, A.B. (2009). The role of student characteristics and teacher behaviors in students’ learner empowerment. Communication Education, 58(1), 35-53. Http://dx.doi.org/10.1080/03634520802237383Hur,M.H. (2006).Empowermentin terms of theoretical perspectives: Exploring a typology of the process and components across disciplines. Journal of Community Psychology, 34(5), 523–540. Lim, D.H., & Morris, M.L. (2009). Learner and instructional factors influencing learning outcomes within a blended learning environment. Educational Technology& Society, 12 (4), 282–293. Lim, D.H., Morris, M.L., & Kupritz, V.W. (2006). Online vs. Blended learning: Differences in instructional outcomes and learner satisfaction. Journal of Asynchronous Learning Networks, 11(2), 27-42. Michinov, E., & Michinov, N. (2007). Identifying a transition period at the midpoint of an online collaborative activity: A study among adult learners. Computers in Human Behavior, 23(3), 1355-1371. Owston, R.D., York, D., & Murtha, S. (2013). Student perceptions and achievement in a university blended learning strategic initiative. Internet and Higher Education, 18, 38–46. Tapscott, D. (2008). Grown up digital: How the net generation is changing your world. New York: McGraw-Hill. Thai, N.T.T., De Wever, B., Valcke, M. (2017). The impact of a flipped classroom design on learning performance in higher education: Looking for the best “blend” of lectures and guiding questions with feedback. Computers& Education, 107, 113-126. Vo, M.H., Zhu, C., & Diep, A.N. (2017). The effect of blended learning on student performance at course-level in higher education: A meta-analysis. Studies in Educational Evaluation, 53, 17-28. Zimmerman, M.A. (1995). Psychological empowerment: Issues and illustrations. American Journal of Community Psychology, 23(5), 581-599.